Jimmy, Jimmy, poor little Jimmy, oh dear poor Jimmy, but you’ve tossed a massive softball to thousands if not hundreds of thousands of educated liberals in America to hit out of the park in debate. This liberal can’t resist however easy the task. Sometimes you have to turn to big government to save the United States of America. Oh, that includes the Federal Government, itself big government in relation to any individual state at any time in our history. It would be relative to the populace big government too. In 1861, eleven slave states claimed to have left the Union and formed themselves into the Confederate States of America, so called, and led by millions of armed insurgents or those who aided them, all attempting to destroy that nation which our founders had with so much sacrifice brought into existence in 1776. It was not some moderate or small threat but one that taxed the national or Federal Government to its maximum, requiring the Lincoln Government to drastically expand the power and the reach of our previously weak national government in order to prevent the extinction of that government and our experiment in democracy; our republic itself hanging in the balance. Lest you think this Federal Government effort was puny by comparison to today’s version, 1.7 million men were mustered into the Union Army—Federalized– even if raised in the Union free states. Between 1861 and 1865 this little ineffectual Federal Government of DeMint’s killed one in four white adult Southern males. That’s absolutely correct. But was there in the Emancipation Proclamation anything not so love oriented? A war measure? Yes Senator DeMint the Feds were on you guys by the millions with military force. Can you just feel the Federal love? “ . . . and that the Executive Government of the United States, including the military and naval authorities thereof, shall recognize and maintain the freedom of said persons.” (those who were declared henceforward and forever free). Just how Jimmy do you think the military was going to recognize the freeing of these slaves it encountered? Well of course by letting them know they were free wherever the Union Army was to go for the rest of the entire Civil War, even if a given commander was a War Democrat who distinctly blanched at freeing blacks at all. It was an order from the President. The same goes for another portion of this part of the Proclamation. How was that to be done? Well, if the Union lost the war it would be impossible to maintain their freedom. So military commanders endeavored to do a shocking thing: win that war! Or in common parlance, beat the snot out of the Confederate Armies; moving through places like Memphis, Richmond, Charleston, Savannah, much of Florida, Alabama, Mississippi, Georgia, (remember that Sherman led bunch that marched 340 miles to the Sea and Savannah, Georgia from Atlanta? ), New Orleans, and a whole lot more. Well, it would take something more permanent than just a war measure to tell Southern slaveholding states to jettison the “peculiar institution” for good DeMint would argue. Here too, it is just so easy; like taking the proverbial candy from a baby. Obviously DeMint might have considered accepting the President’s invitation to an exclusive showing of Spielberg’s Lincoln last year. I can just see Daniel Day Lewis making that point about the President being invested with such enormous power. The guns had yet to fall silent when the Federal Congress of the United States passed the Thirteenth Amendment to the Constitution of the United States. In the interview DeMint droned on about how the freeing of the slaves had been a product of the Constitution. Even in its Dred Scott Decision clothing from 1857 until 1864 it was the third branch of the Federal Government declaring that the Constitution “expressly affirmed” slavery and a more liberal court during some of the worst killing of the 1864 campaign declaring that piece of supreme court excrement unconstitutional as it remains today! Worse yet for DeMint’s demented U.S. History lesson, the Thirteenth Amendment was passed by Congress, itself a portion of the Federal or national government with 1.7 million now fully trained killers to induce passage of the Amendment not only in the Union states but in the soon to be former Confederate states as well. As Reconstruction got underway (itself a ridiculously big government set of policies) much of those armies were still occupying the South. That Thirteenth Amendment abolished slavery or involuntary servitude save for serving a prison sentence in the United States or anyplace controlled by that national government–forever. That’s a long, long time to be wrong Jimmy. Now we all know that among the greatest factors in freeing the slaves were the slaves themselves. And the legacy of 186,700 armed and dangerous black U.S. 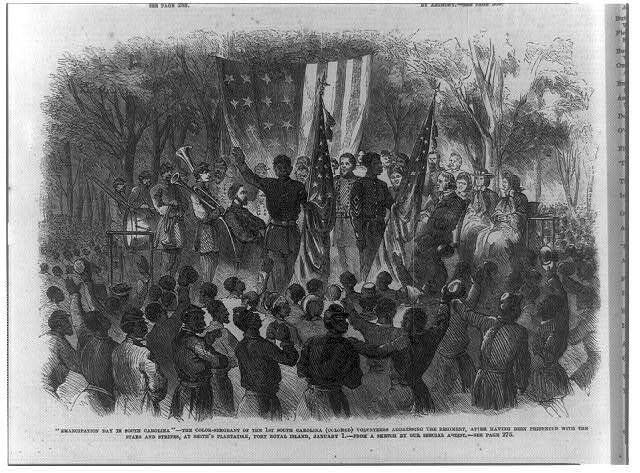 Colored Troops (USCT) made the whole difference. But their hopes and ability to act so courageously was greatly aided by what the Lincoln or Federal or National American big government was doing and would do. The slaves knew that the government of the United States was now firmly on their side. Game, set, and match. A liberal has just won a debate arguing that big government however you define its size in any era of our history, has freed the slaves. And conservative Republicans can whine on all they wish about how this was an “outlier” and that big government has not been needed for anything significant much in American history as Jim DeMint actually did in that interview. Once upon a time (or is it continuously each generation) the entire economy tanked and all Americans got a New Deal where just in the first 100 days Congress passed and the President signed fifteen measures greatly expanding the power of BIG government, hell, creating the real and true BIG government that probably has our conservative friends chilled too the bone in fear already. Once upon a time there was little Hitler in Germany, Mussolini in Italy, and the distant and unapproachable Sun God, Hirohito in Japan . . .
Once upon a time there was this guy Lyndon Johnson who pushed Congress (the big bad Feds again) to pass the Civil Rights Act of 1964, the Voting Rights Act of 1965 in the Second Reconstruction. Once upon a time there was this evil Empire, from 1946 to 1989 threatening our very way of life, the Cold War was pretty hot for a long time, and the cry of Communists in our midst was heard across the land. Once upon a time there were grumpy old men and women who insisted on an old age pension called Social Security, and a health plan until they died called Medicare, and for the poorest, Medicaid. Don’t ya think individual States or local groups of citizens might in these cases thought it expedient to come together as well, by the millions and not just tens or hundreds of thousands? A nation? Unified? How is this best effected? Yes, finally Jimmy you have learned your lesson. The Federal Government, the BIG bad government you so much complain of. This entry was posted in Education, Essays, National Affairs, Race and tagged Big Government, Federal Government, Heritage Foundation, Jim DeMint, slavery. Bookmark the permalink.